In the first pAsuram, AzhwAr says “You should appear like a lotus flower filled pond, to remove my fatigue”. vAsath thadam pOl varuvAnE! oru nAL kANa vArAyE! varuvAnE – oh one who is coming! emperumAn is having amazing activities which reveal his simplicity and is having heart-captivating activities in a vAmana form; for me who is having sin, he is being krishNa, who is having divine eyes, divine hand, divine feet, reddish divine lips which are shining due to his gentle smile, as pure reddish flowers; his blackish, divine form which is radiant as a bud; oh one who is coming like an abundantly fragrant pond with huge lotus flowers and is with dense greenish leaves! Mercifully come to be seen one day [by me]. mAyak kUththA – Oh one who is having amazing aspects and heart-captivating activities! To fulfil indhra’s wish, oh one who is having heart-captivating activities such as taking birth one day, growing up the same day and going to beg for alms on the same day, going to the sacrificial arena of mahAbali and calling him like a child “mAvali“! His walk appears to AzhwAr like an expert dancer’s dance. vAmanA – One who begged and who grants whatever one asks him is the one who is making me who is having “seeing him” as the goal, to beg for that and still not granting me my wish. 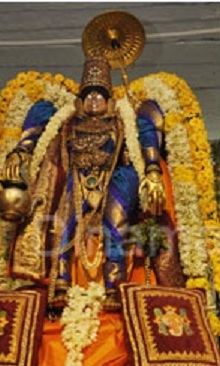 vinaiyEn kaNNA – AzhwAr thinks that just as emperumAn incarnated as vAmana for indhra, he incarnated as krishNa for AzhwAr. Unlike other incarnations, krishNAvathAram is closer [to AzhwAr] in proximity by time; hence he is saying “kaNNA”. Alternatively, it can be said that AzhwAr is saying “kaNNA” since this incarnation is by emperumAn who is common to all, and krishNa allows himself to be claimed as “mine” by those who desire for him. Here AzhwAr is saying “vinaiyEn” (sinner), since he appeared just a little after krishNa’s ascending to paramapadham similar to someone trying to put something in his mouth which hits the teeth and falls down. kaN kai kAl thUya seyya malargaLA – The eyes which establish first relationship with those who approach him, the hand which embraces those who become defeated by his glance, the divine feet at which one will fall after being won over by the embrace, and while being there enjoying those lotus like divine feet and looking up, the divine form which has a contrasting complexion of dark greenish colour. sOdhich chevvAy mugizhadhA – The divine lips which are radiant, which appear like budding. Since bhagavAn is explained in chAndhOgya upanishath 3.14 ‘avAkyanAdhara:’ (does not speak, ignores [in paramapadham]), due to his unfathomable nature, his smile will expand and he will not show any further signs; that is why it is explained as budding. sAyal sAmath thirumEn thaN pAsadaiyA – Being radiant, dark divine form which appears like cool greenish leaves; As said in varAha purANam “purusha: puNdarIkAksha:” (the supreme lord is lotus eyed) and in thiruvAimozhi 9.7.3 “akkamalaththu ilai pOlum” (like the petals of lotus flower). thAmarai nIL vAsath thadam pOl varuvAnE – Like a pond which has blossomed lotus flowers everywhere, being expansive like an ocean filled with a single pond. It appears that such a huge pond filled with fragrance is walking, when he walks as his fragrance comes and hits us. He is said as “sarvagandha:” (root of all fragrances). varuvAnE – Oh one who has the nature of coming! AzhwAr is highlighting how emperumAn came to him before, with gratitude. oru nAL – Like those who say “oru kAl nAkku nanaikka” (let me wet my tongue once). kANa – When he comes, this is the benefit for AzhwAr – that is to see him. This constant seeing is the activity even in paramapadham. To get that benefit here. vArAyE – AzhwAr is of the nature that he will see only when emperumAn voluntarily comes; as said in muNdaka upanishath 3.2.3 “thasyaisha AthmA vivruNuthE thanUmsvAm” (bhagavAn shows his true form to those who are dear to him), he considers that approaching bhagavAn and seeing him with his own effort is against the true nature of the self. This entry was posted in thiruvAimozhi, thiruvAimozhi 8th centum on March 18, 2019 by Sarathy Thothathri.